Three Stripes and You Are Out! Three stripes and you are out? More like three stripes and you are in! 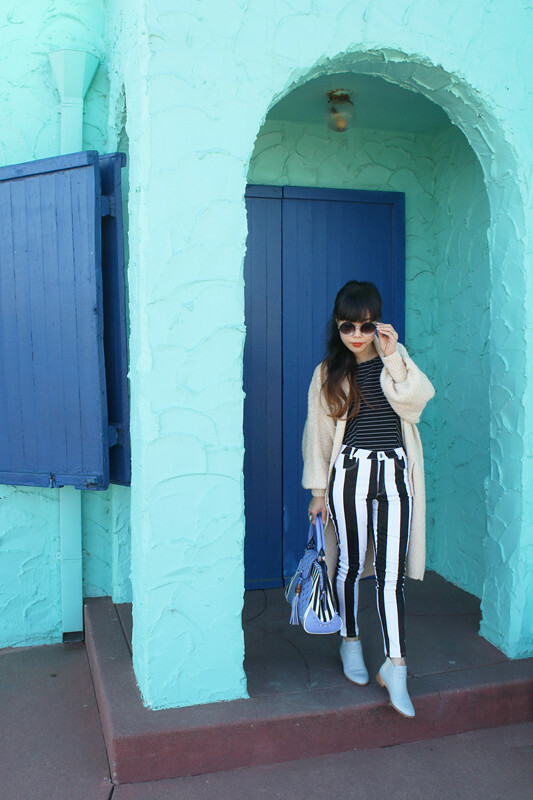 I have always loved stripes and I am so thrilled that bold stripes is trending this Spring. So why not wear three different sets of stripes in one outfit? I styled this look around the amazing Roya bag from my new sponsor Melie Bianco. I just couldn't resist periwinkle blue, stripes, grommets, spikes, and tassels. Sometimes too many elements combined into one can be too much, but this one is done just right. 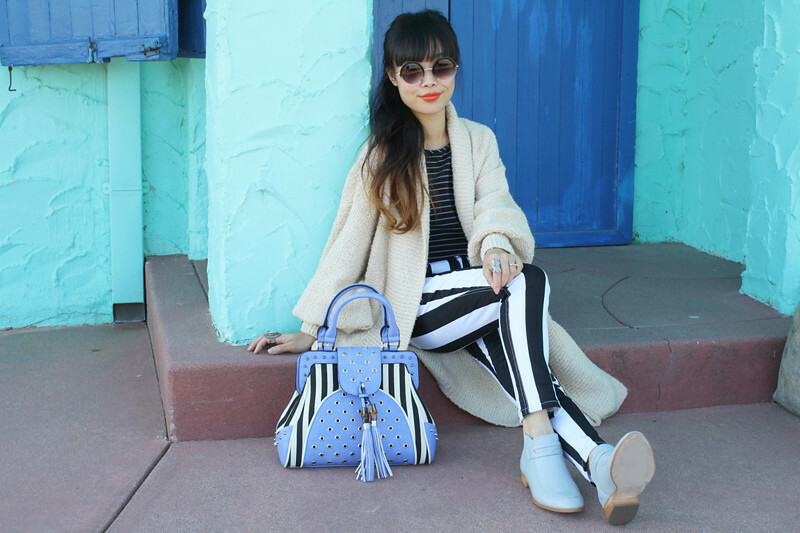 I paired it with striped Jordan jeans by Motel and striped top by Finders Keepers (you can't tell but the stripes are periwinkle blue just like the bag and my Plomo loafer flat boots). Lastly, I tossed over an oversize sweater coat to give this straightly shaped look some volume. Three stripes, five stripes... I will wear however many stripes I want! Fashion has no rule after all! Striped top c/o Finders Keepers. Striped Jordan jeans c/o Motel. Vintage oversize sweater coat by from ShopEBV. 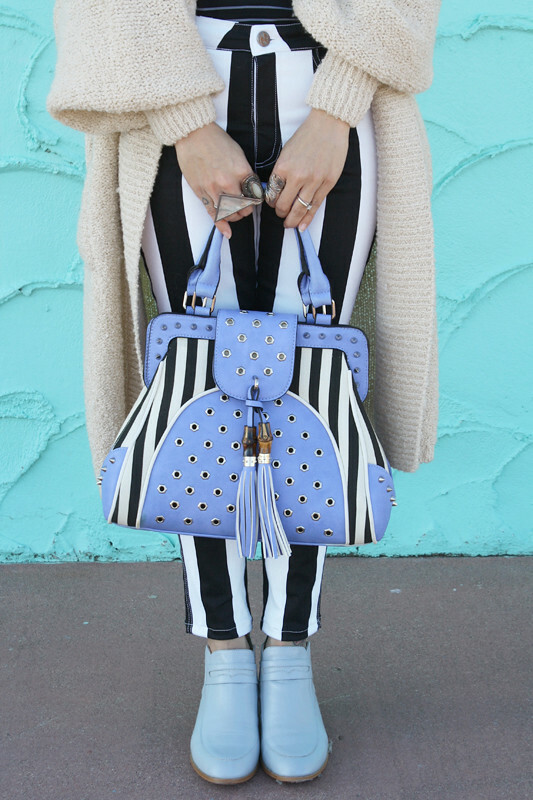 Roya stripe doctor bag c/o Melie Bianco. Round ombre sunglasses from Ebay. Love this outfit - love the stripes together - I am also in love with the jacket in the post below !..